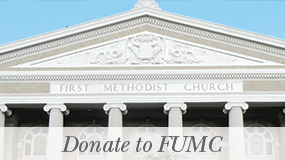 Pastor Taylor Fuerst joined FUMC as Senior Pastor in July of 2016. Prior to serving at First Church, she served as Senior Pastor of Westbury UMC in Houston, TX. 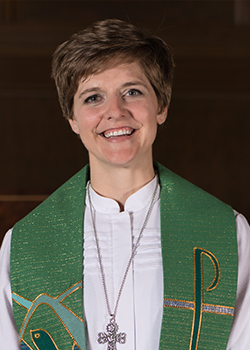 Her previous appointments include Associate Director of the Center for Clergy Excellence at the Texas Annual Conference, and Associate Pastor of St. Luke’s UMC in Houston. Taylor felt called to ministry as a teenager, but after completing her B.A. in Religious Studies and Psychology at Southern Methodist University, she began her M.Div. at Duke Divinity School with the intention to complete a Ph.D. for the purpose of teaching and training Pastors. Not until her first internship, when she found herself standing in the pulpit of a tiny, rural North Carolina church, did she recognize God’s call for HER to preach and pastor a congregation. Taylor loves the “aha!” moments in ministry, when she witnesses others encountering God’s transforming grace through worship, study, service, and unlikely relationships. Often, the greatest and most transformative discovery is also the simplest: You are loved by God! Through preaching, she hopes to invite others to continually reorient their lives to be a part of the transformation God is doing in the world. Taylor is married to Rev. 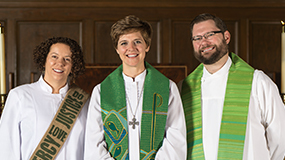 Brad Fuerst, an Ordained Pastor in the Evangelical Lutheran Church in America (ELCA). Brad serves as Campus Pastor to the Lutheran Campus Ministry at the University of Texas at Austin. Together they are raising three children. When time allows, Taylor enjoys reading, walking the hills of Austin, and rowing and kayaking on Lady Bird Lake.